Rabih Mroué is an actor, director, playwright and a TDR Contributing Editor. In 1990 he began putting on his own plays, performances, and videos. Continuously searching for new and contemporary relations among all the different elements and languages of the theatre art forms, Mroué questions the definitions of theatre and the relationship between space and form of the performance and, consequently, questions how the performer relates with the audience. His works deal with the issues that have been swept under the table in the current political climate of Lebanon. He draws much-needed attention to the broader political and economic contexts by means of a semi-documentary theatre…. 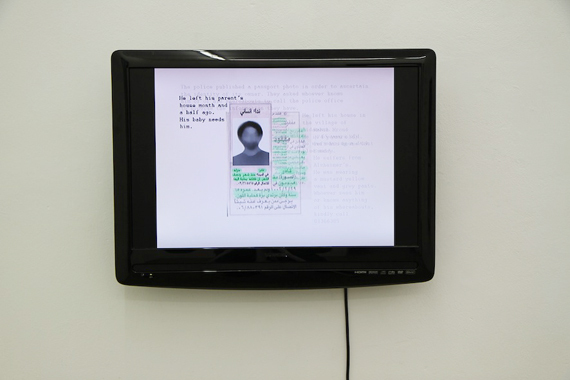 I the undersigned, 2006, 2 channel monitor screening, sound, colour, 3:52 min., Edition of 5 + 1 a.p.